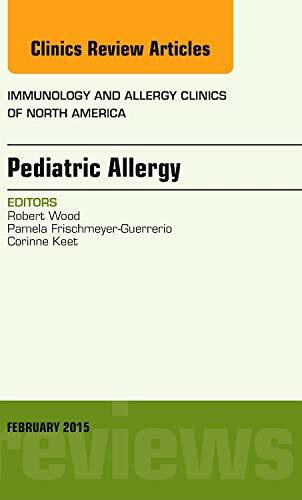 This issue of Immunology and Allergy Clinics of North America, guest edited by Drs. Robert Wood, Pamela Guerrerio, and Corinne Keet, is devoted to Pediatric Allergy. Articles in this issue include: Role of the Environment in the Development of Allergic Disease; Genetics of Allergic Diseases; Optimizing the Diagnosis of Allergic Disorders; Anaphylaxis and Urticaria; Food Allergy: Epidemiology and Natural History; Inner City Asthma; Potential Treatments for Food Allergy; Eosinophilic Esophagitis; Atopic Dermatitis; Pediatric Asthma - Guidelines-based Care; Asthma - The Interplay Between Viral Infections and Allergic Diseases; Allergic Rhinitis; and Drug and Vaccine Allergy.